I now recommend using the “Windows 10 Subsystem for Linux” which provides an Ubuntu bash shell, to install and use Jekyll. This is how I use it myself. I’ve been using Jekyll to create static websites on GitHub Pages, but I was unsure how to install it with dependencies I wasn’t used to (NodeJS & Ruby). Here is the easiest way to get Jekyll set up on your machine in just a couple of minutes. You need to have Chocolatey installed on your machine. Chocolatey is the BEST way to install and keep applications updated on windows. Close the command prompt as Chocolatey will not be available until you close and reopen. Now you can use standard Jekyll commands to create a new site and serve it e.g. 2016/12/05: Added details on how to get resolve the Ruby Gems certificate expiring. And added gem bundler which is a new requirement. Works like a charm from my Windows 10 machine. Thank you! I was able to publish as Github pages. Note that the chocolatey install line disappears off the page in chrome. Works for me on windows 10. Thank you very much. Thank you. Works really well. Thank you David, it works like a charm! ruby not installed. The package was not found with the source(s) listed. Chocolatey installed 0/1 package(s). 1 package(s) failed. first,I must cross The GreatWall. One thing that I’m stuck on is post installation and serve I get a warning: “please add the following to your Gemfile to avoid polling for changes: gem ‘wdm’, ‘~> 0.1.0’ if Gem.win_platform?”. The main Jekyll site also recommends this. What is the Gemfile, and how do I locate it locally? The title of this article is really a false advertisment. To install the Ruby, you firstneed Chocholatey. To install that you need powershell. The `gem` is another thing you probably need to install, but here the article author doesn’t even bother mention it. 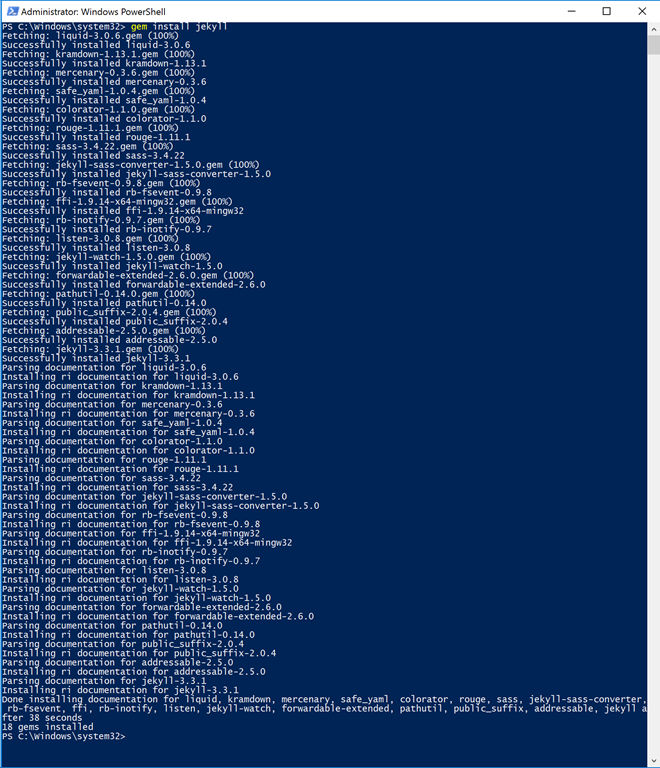 `gem` is from ruby, and powershell is integrated to windows. Working perfect on Windows 8.1 professional after upgrading Ruby. Sooo easy! Is there a way to update ruby to 2.3.1? Worked perfectly on Win7 with no previous choco or ruby installation. Thanks! Well, thanks for the guide, this guide works fine by default. But, the mybolg is created under system32. That would be very great if you can add more guides on how to create project in other folder as there are a lot of issues if simply following the original commands. Seems it is a path issue, I am an newbie on Ruby. Thanks for any advice. Thanks for posting! However it was not so “easily” for me. Dependency Error: Yikes! It looks like you don’t have bundler or one of its dependencies installed. In order to use Jekyll as currently configured, you’ll need to install this gem. The full error message from Ruby is: ‘cannot load such file — bundler’ If you run into trouble, you can find helpful resources at http://jekyllrb.com/help/! I had the same problem, and your solution worked. Thanks! Thanks for the workaround. I have updated the post with these extra details. Hopefully the new SSL cert gets bundled in the future. You also need to install DevKit, otherwise `gem update` won’t work. Fortunate we have this: https://chocolatey.org/packages/ruby2.devkit . Needs testing though. I’m on windows 10 and am sooooo close. What does this mean? How do I fix this? Great post! But there is a typo at the command line for Chocolatey installation. ‘))” is missed after install.ps1. Still getting “‘jekyll’ is not recognized as an internal or external command, operable program or batch file” – any suggestions as to where I’m going wrong?